We create your letterhead according to your expectations and the identity you want for your company. Your new letterhead could be printed by your local Printer or directly by your office Printer. 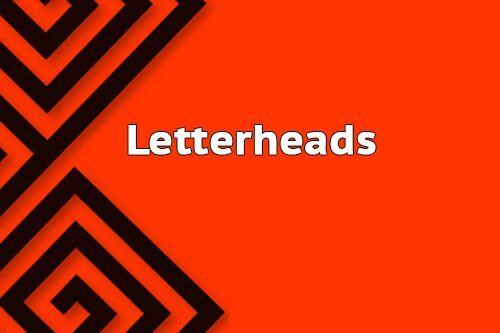 Stand out and boost your interlocutors’ interest with a professional letterhead! Your letterhead is one of the first drivers to create a professional image for your company and brand. Your recipient perceive the importance you are giving when you are communicating it to him/her. It also helps your interlocutor to clearly identify your company avoiding any confusion and enhancing the quality of the relationship. With this Gig, you control what you want to show on your letterhead. In addition, the most popular letterhead size is 8.5″ x 11(A4)”, but you can opt for a different size. Otherwise, if the size you are looking for isn’t mentioned in our Gig options, you can request for a custom quotation by visiting our Custom Printing Gig. Low Cost Web Agency provides affordable solutions and high level designs for your Company Stationeries’ all over the world. What else, no need to wait… buy now!